MFSL Aluminum CD - items 25 to 50 Shop MyMusicFix!! "The Amos Garrett Doug Sham Gene Taylor Band, Live In Japan - MFSL Sealed Alumunum CD"
Live In Japan Track listing 1. T-Bone Shuffle 2. Talk To Me 3. Don't Lie To Me 4. Lawdy Miss Clawdy 5. Walking Blues 6. Sleepwalk 7. Sweet Home Chicago 8. Smack Dab In The Middle 9. Shake, Rattle And Roll 10. Gene's Boogie 11. Next Time You See Me 12. Sukiyaki Details Playing time: 45 min. 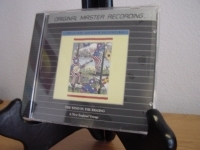 Producer: Holger Peterson Distributor: n/a Recording type: Live Recording mode: Stereo SPAR Code: n/a Album notes Personnel: Amos Garrett (guitar, vocals), Doug Sahm (slide guitar, guitar, vocals), Rocky Morales (tenor saxophone, harmonica, vocals), Gene Taylor (piano, vocals) Jack Barber (bass, vocals), George Rains (drums). Recorded live at Club Quatro, Aoyama Cay and Kudan Kaikan, Tokyo, Japan; A.M. Hall, Osaka, Japan; Taku-Taku, Kyoto, Japan in May, 1990. Includes liner notes by Richard Flohil. "The Mystic Moods, Another Stormy Weekend - Mint MFSL Aluminum CD"
"The Sensational Nightingales, Heart And Soul/You Know Not The Hour - MFSL Sealed Aluminum CD"
Heart And Soul/You Know Not The Hour Track listing 1. Golden Streets 2. Another River 3. Saints Hold On 4. Christians We Are The Ones 5. Better Hone, A 6. Working On A Building 7. Old Rugged Cross, The 8. Going On With Jesus 9. Brightly Beams 10. You Know Not The Hour 11. Mother Mary And Joseph 12. Giving You A Warning Sinner 13. I Shall Know Him 14. Jesus Took My Burdens Away 15. God Is Not Pleased 16. Nothing Between 17. How Great Thou Art 18. Love Lifted Me Details Producer: Don Robey, Ira Tucker Distributor: n/a Recording type: Studio Recording mode: Mixed SPAR Code: n/a Album notes Originally released as 2 separate LPs. "The Wind In The Rigging, A New England Voyage - MFSL Aluminum CD"
"The Wind In The Rigging, A New England Voyage - Factory Sealed MFSL Aluminum CD"
"Webb Pierce, Sands of Gold/Sweet Memories - MFSL Sealed Aluminum CD"
Sands Of Gold/Sweet Memories Track listing 1. Please Help Me I'm Falling (Back In Love With You) 2. Sands Of Gold 3. Blue Mood 4. Don't Let Me Cross Over 5. Roses Are Red (Violets Are Blue) 6. My Love For You 7. Detroit City 8. Those Wonderful Years 9. Nobody's Darlin' But Mine 10. If The Back Door Could Talk 11. True Love Never Dies 12. Smile Of A Clown, The 13. Wolverton Mountain 14. Send Me The Pillow You Dream On 15. Who Do You Think I Am 16. Life's Gone And Slipped Away 17. Welcome To My World 18. Ready 19. Love's Gonna Live Here 20. Here Comes My Baby 21. Hobo And The Rose 22. Champ, The 23. Fool 24. Sweet Memories Details Playing time: 62 min. Producer: Owen Bradley Distributor: n/a Recording type: Studio Recording mode: Stereo SPAR Code: AAD Album notes Includes original liner notes by Hugh Cherry. SANDS OF GOLD was originally released in 1963, SWEET MEMORIES was released in 1965. James Gang, Live In Concert - MFSL NEAR MINT Aluminum CD"
Live in Concert - MFSL NEAR MINT Aluminum CD Track listing 1. Stop 2. You're Gonna Need Me 3. Take a Look Around 4. Tend My Garden 5. Ashes, The Rain and I 6. Walk Away 7. Lost Woman Details Producer: The James Gang Distributor: n/a Recording type: Live Recording mode: Stereo SPAR Code: n/a Album notes The James Gang: Joe Walsh (guitars, keyboards, vocals), Dale Peters (bass), Jim Fox (drums). Recorded live at Carnegie Hall, New York. All songs written or co-written by Joe Walsh except "Stop" (Ragavoy/ Schuman), "You're Gonna Need Me" (Albert King), and "Lost Woman" (Dreja/Beck/Relf/McCarthy/Samwell-Smith).